A few people recently have asked me about my blogging and why I do it. How I come up with content ideas, how I stay motivated, and so on. It's gotten me to thinking about why I do it and what I'm trying to achieve. Recently I watched the kinda-terrible but still amusingly-knocked-off-of Revenge of the Nerds movie Sydney White. Yes, it stars Amanda Bynes. No, I didn't choose it. But anyhow there was a blogging character in the movie (one of the geeks, of course) who said the line "you don't blog for the readers, you blog for the writing." I think that's pretty true for me. I've been a writer for a long time. Not in any public way, but I was an avid diary keeper for many years, wrote epic letters to my friends (and almost failed grade 9 typing because of it) and when ye' ol' internets came to be, I started writing epic emails as well. 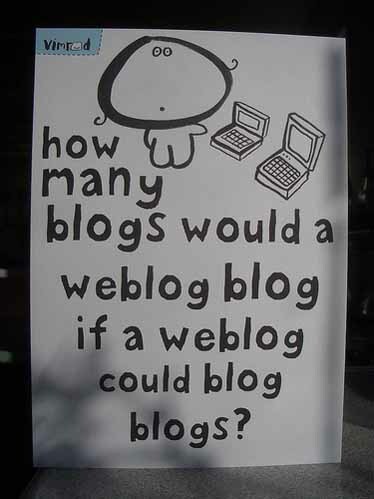 I first dabbled with blogging back in 2004 with an anonymous blog that I now can't remember the name of, but I think it's still out there. I used it to vent about various problems in my life, emotional moments spilled onto an internet home I don't think anyone was reading. It felt good. I'd like to find it again. I also blogged a bit on myspace, (which reminds me, I'm going to go login over there and check it out, just for kicks) and then moved to a blogspot blog that was also anon. I was encouraged to continue by a friend who told me he saved all the emails I wrote him so he could read them again later, because they made him laugh. I figured if that was true maybe other people would enjoy reading what I was writing. And since I was enjoying writing it, there was no loss to doing it. It's free, it's cathartic, it's win-win. Then I moved here, to jacquiesevers.blogspot.com. What I've come to enjoy about writing my blog is that it creates this little square on the web that is mine, all mine. As well it's a permanent place, or at least as permanent as anything on the web is, where my history is being written. I moved the blog to being under my first and last name because I decided it was something that I might enjoy looking back at in 10 years. Who knows what opportunity it could bring. I also figured if I was going to spend time on it, that I might as well take ownership of it. Some things I stopped writing about because I decided they were too personal. A gal's got to have some mystery. Other things I thought might hurt my real-life career in some way, (people like to tell me this is false but I know conservative business better than anyone I think, so I know differently) and that I didn't need to be publicly talking about them anymore. In another way, I started to feel a little one-note. I'm not a very one-note person, I'm interested in a lot of different things. So, if I feel that need to vent now, I do it in an email again, to the person I think is most interested in that writing. So far, it's helped me get the job of my dreams so that's a good start. It also helped me get that little column in the paper. I couldn't have predicted that outcome, but it's kinda cool it happened. 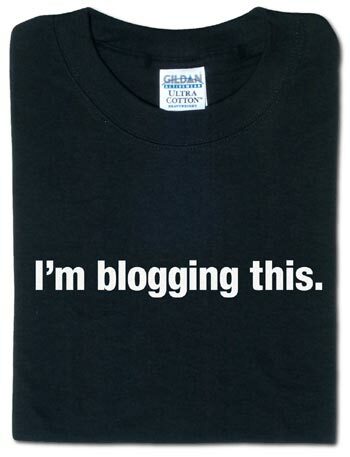 Bloggers, why do you blog? 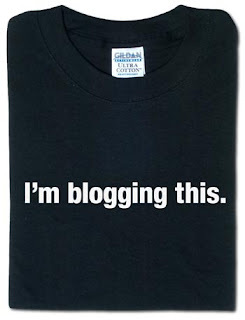 There's a lot of blogs out there right now that are about being the authority on a particular topic. They want you to sign up for their newsletter, and follow their twitter and learn from them. That's not what this blog is about. Maybe I'm not doing it right but I don't care much for rules, really. This isn't an effort to get fame or money or to make a living. If it was, I'd approach it differently. Besides, I do write another blog that's for commercial purposes as its heart, and that's a different beast. What you're getting here is a diary, one that is as much as I'm comfortable sharing (with my real name attached in bold letters) and a written record of the interesting things I like and do. It's much less stabby than my earlier blogs but I want it that way. I think my other blogs were too stabby and really, in real life, I'm not a very angry person most of the time. I'll leave anger to other people. Some critics of bloggers and tweeters say that we're narcissists. That we think, somewhat incorrectly, that the world cares. Oh, maybe that's true, I've never been great at the whole knowing-ones-self thing. But to me, it's more about sharing because that's what I'm interested in from other people. I love reading other people's blogs and tweets, even the inane ones about what they're eating for dinner. Am I nosy? Yes, I think that would be a fair statement. Do I have a life? Yes, a busy one. I just find real people more fascinating than characters on Two-and-a-Half-Men. I'd rather spend a half hour reading a blog by someone I don't know anything about than watching a fictional character demean a woman, ok? Real life is pretty entertaining. The statement being thrown 'round of late, "The Internet is Dead" is true in so many ways. When was the last time you went to the net to browse websites that weren't crowd-sourced or user-created? YouTube, Wikipedia, Trip Advisor, Chow Hound, social media platforms, all the ones with the most interesting stuff are the ones that users themselves create the content for. I think it is because we're isolated in our lives. We've lost, in many ways, the art of conversation, the art of sharing intimately. We work so much and barely have time to get to know one another, so these portals into private lives are our ways of sharing, connecting and relating. The beautiful thing about it is that people for many years said the internet would close us off from one another but in many ways it has opened us up to one another, has made us connect in new and more personal ways, if not face-to-face, at least on an emotional or mental level. Why do I blog? I blog for the writing, the creation, the joy of sharing, as a place to put up photos and talk about adventures, as a home for my thoughts and ideas, and to create a place that in time I can go back to and remember who I was, at this moment.